Love the look of statement necklaces, but not sure if you can pull them off? Or do you love statement necklaces and need new inspiration on ways to wear them? We asked Grace Wainwright, author of A Southern Drawl blog and statement necklace aficionado, to give us her best tips. Click through for 10 fabulous statement necklace ideas! Wearing statement necklaces can enhance your wardrobe and transform your outfits. Pairing a basic tee with a glitzy statement necklace can do wonders, and easily transition your outfit from day to night. When a top or dress has a V-neckline, try throwing on a statement necklace, especially one with a tiered structure that follows the shape of the shirt. It adds more dimension to the outfit and fills in some of that empty space that may seem bland. Sound too specific? No worries -- most bib necklaces follow the V-neckline. Looking polished doesn't have to be boring. Wear a button-up blouse and add a statement necklace around the collar. It’s a great way to spice up an outfit while still keeping a professional look. 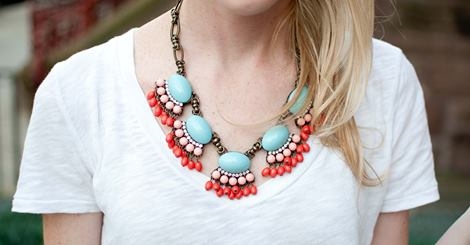 Bonus points if the statement necklace provides a pop of color. Talk about sophisticated chic! Who says you can’t wear more than one necklace? Try layering a couple of necklaces together to make an even bigger statement. Fiddle around with a few to see which ones work best with each other. Pair a smaller necklace with a statement piece to give some balance or layer two chunky necklaces to draw even more attention. If the neckline of a top or dress is really detailed and covers most of your chest, try skipping out on the statement necklace. Don’t fret -- you can always opt for some statement earrings instead of a necklace to still create an accessorized look. During the winter months, your statement necklace may be covered by a heavy coat, a jacket, or layered sweaters. Here's a trick -- replace a statement necklace with a statement scarf, such as a plaid blanket scarf. It accessorizes your outfit in a cozier way that is well-suited for chilly weather. Coordinating your clothes with a statement necklace is an easy way to take your outfit to the next level. If you have a certain color scheme, try choosing a necklace that matches the color palette. It can sometimes be overwhelming to wear a statement necklace with other accessories. Pair some smaller and subtler earrings with a necklace in order to keep the focus on the statement piece. Diamond, gold, or silver studs will do the trick. Shift dresses always have a high neckline and beg for a statement necklace. Accessorizing a shift dress with the perfect necklace can easily make it more flattering, as well as more suitable for dressier occasions. Try adding an up-do hairstyle to show off the necklace and make the look more sophisticated. Stripes on any outfit are great for statement necklaces because they have one basic pattern. It allows the statement necklace to pop and makes for a classic outfit. Black stripes and a chunky pearl necklace create a timeless look. Do you have clothes with colored stripes? Add a crystal statement necklace to add more depth to the outfit.